Discussion in 'California & Hawaii' started by ewiccami, Apr 9, 2008. 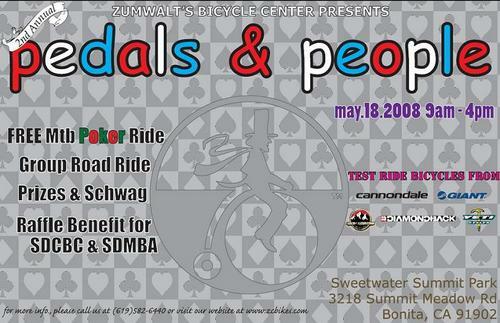 We (Zumwalt's Bicycle Center) will be hosting our second annual Demo Day & Poker Ride May 18, 2008 from 9 a.m. to 4 p.m. at the Sweetwater Summit Park in Bonita. As mentioned in the title, the Demo will feature the latest bicycles from Cannondale, Diamondback, Giant, Rocky Mountain, and Yeti Cycles. We will also be hosting a FREE Poker Ride w/ Prizes from the shop and from various vendors. 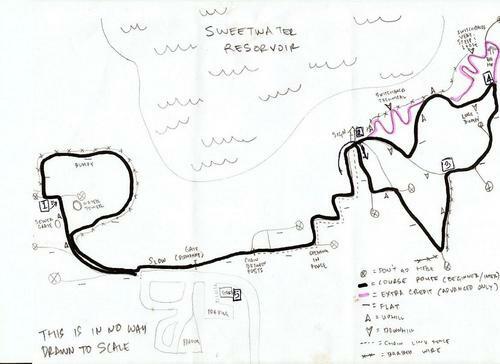 The MTB Poker Ride will be an 8 to 12 mile loop with many trails in the surrounding area for those who would like to ride more. In Addition to the MTB Poker Ride we will be adding a group Road Ride to this year's events which will be about 25 to 30 miles. Participants in the Road Ride will be given a hand in the Poker Ride after completion of the ride. There will also be a raffle benefiting the San Diego County Bicycle Coalition (SDCBC) and San Diego Mountain Bike Association (SDMBA) with prizes from a lot of various vendors. Food will be provided. For more info check out our website at www.zcbikes.com (info. to be posted) or give us a call at the shop. If my back is healed up I'll be there. the "j" word definately trips the sentinel. The'll be over at your shop in no time. oooo new customers! haha... the Sentinel!!! So dark and mysterious. We're 3 1/2 weeks away... it's gonna be a good one. Just so you all know, we'll be selling raffle tickets at the shop and at the event for $1 per ticket or $20 for 30 tickets. Prizes sponsored by Canari, Camelbak, Cannondale, Giant, Giro, Diamondback, Intense Tires, Niterider, Oakley, Rocky Mountain, Schwalbe, THE, Vitalyte, & Yeti. Hope to see you all there. edit: Can someone explain what the Poker Ride is? I'll swing by next monday and buy some raffle tickets. The flier for the event for anyone interesed. Northern Mexico, Chulajuana (619). Orale! Umm, this event is in Bonita, Southern San Diego. Just in case you didn't see it on the flyer. yep i saw that. it just that a national one with UCI points is rare in the US, and it's not like its Reading or Eureka man, its only Santa Barbara. Easy man, I know what is going on. Some people don't race and for the LOCAL San Diegans who would like to ride and demo bikes or go on the ROAD ride, this is just a heads up on the event. I'm sure it is not a threat or an issue in terms of attendance at your National race. I just thought it was slightly rude to intercept this thread the way you did ( with the: lthumbsdown: ) pretty unprofessional in my opinion. But no need to go on, good luck with your race. Ha! That would be called SPAM!!! Wait, let's be a little more specific here and call it what it is. It's a XC National. And the last time I looked, there are several XC races every year in the US awarding UCI points. Last time I checked 4 of the 24 XC nationals held this year will award UCI points. Not so rare. Lastly, this is the 9th year that you've held a National event? I believe last year was the 1st. IMO, this is what makes everyone so confused. Let's just call a spaide and spaide and play our cards as we see fit. Misleading SPAM is even worse! So if this year is our first time at the demo, is that our 4th Annual visit? Since it's technically in the South Bay, the free food provided should include pancit and lumpia. mmmm pinoy food. I'm so there. Scored 30 raffle tickets already. Hey guys, $20 bucks gets you 30 tickets! Thanks dude! Now i'm craving a cali burrito from lolitas. I gotta drive all the way over there. You know how much gas that's gonna use. not much cuz I'm only 7 min away. Pbody & Fonzie, I just try my best to promote the sport of cycling in general. It frustrates me when I see another event anywhere in SoCal that is scheduled on the same date as one of our events that we work so hard on annually. It doubles the frustration factor when I approach bike companies to participate in our Expo (over 40 booths last year) and they tell me that their at a bicycle shop demo day, sorry. As for the status of our event, here is the truth, the XC is the UCI sanctioned event, however the DH, Dual Slalom, Super D and STXC all have National Mountain Bike Series points awarded so these races while not UCI are granted higher USAC regional ranking points than smaller races. Also, having only 4 XC events nationwide receiving UCI points (all NMBS events) is pretty rare when one considers the shear number of USAC sanctioned events annually. It is one of 2 in the state of CA, Fontana NMBS was the other. Sorry if you feel that I was less than professional in my hijacking of the thread or in my approach, for that I apologize. I will try to do better next time, after all, we all want to see the same thing, more people riding bicycles. Date conflict should be avoided when ever possible though. Good luck with your event. Ps. It's the 9th Annual SYV Classic (formally the Firestone Classic), that this year happens to be a National. I said South Bay, not THE SOUTH. Dude, I live in the tijuana suburb where crepe is considered nuttela quesadilla. Pancit!! Well, I know now that the demo & poker ride conflicts with the Santa Ynez national. Fyi, when we started planning this event last year, there were No events planned for this day. At least they hadn't been posted yet, that is. We do our very best here to make the event not conflict with any other events, but if you look on our calendar, there's a ton of other events on the 18th, including the National. Our event may be just a little local bike shop event, but I truly believe that it is just as important as any National or Event out there. This is a ride/event/gathering for us and our customers. It gives them an oppurtunity to hang out with like minded individuals and just enjoy the sport/lifestyle of cycling. This event, besides being a fun ride is also a chance for us to raise some money for something charitable. This year, we've chosen to do it for the SDCBC and SDMBA, which work very hard for bicycle advocacy in San Diego County. Anyways, enough bickering... it's a beautiful day. We should all be out there riding our bikes instead of wasting away online Hopefully you all can make it to the ride, or national, or whatnot... just ride. "it's all about the ride"
That's all for now, but if I hear anything else, I'll be sure to let you all know. See you all there. 303 on display only?!! I'd like to ride over some park benches with that thing. GREAT TIME TODAY!!! Awesome setup with a great turn out. The demo peeps were on the ball and were really knowledgable. Test rode the Yeti ASX, Diamondback Mission 2, and the Titus El Guapo. Food was excellent, Swag Was great too! THANKS ZUMWALTS!!! Just wanted to say thanks to everybody who made it out yesterday. It was sooo fun, and it was just awesome being out in that SD Sun. Definite thanks to all our volunteers and all the companies that made yesterday possible!